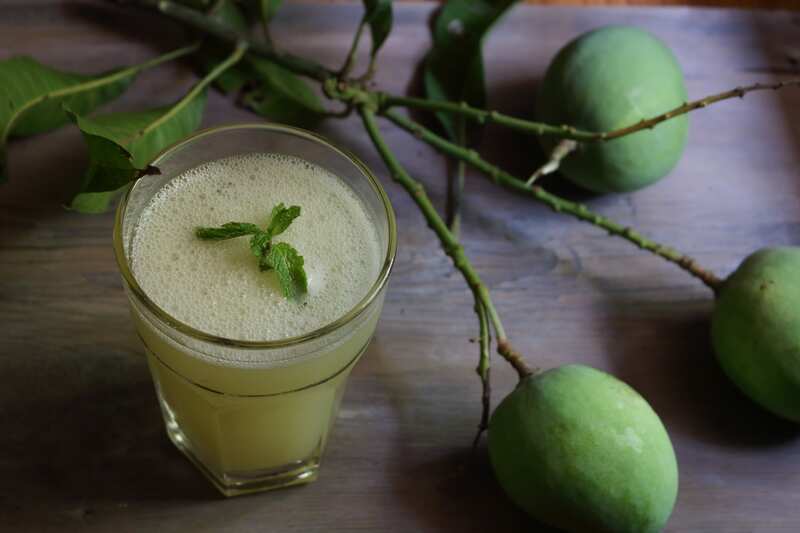 aam panna is a popular summer drink seasoned with sugar, black rock salt and cumin. March was a month of crashing mangoes. In the short burst of spring the air was filled with the sticky scent of mango blossoms. Within a few weeks the same branches are bent low with fruit, eager to shed their weight. Temperatures climb higher every day and we yearn for cold, liquid comfort for our parched throats. 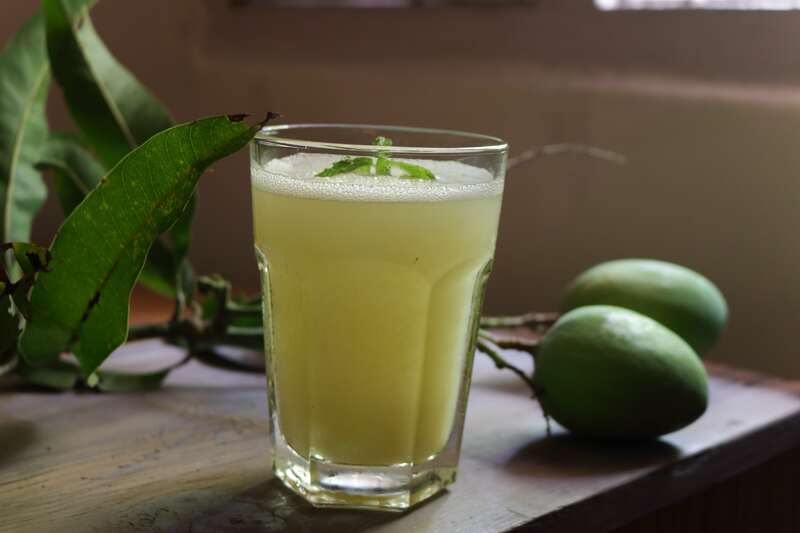 Happily, the bounty of sour, raw green mangoes is perfect for making big jugs of tangy, salty-sweet aam (mango) panna, a traditional, much-loved summer drink. In the scorching Indian heat, when the body is leached of fluid and essential salts, I want a refreshing, replenishing summer drink in my fridge. To make aam panna, raw mangoes are cooked to soften their hard flesh into a pulp. Peeled and pureed, the resulting concentrate is a thick, viscous liquid. Aam panna is seasoned with Himalayan black rock salt, (kala namak) sugar and powdered cumin, to counter the sharp sourness of raw mangoes. Black salt, according to Ayurveda is said to cool the body and its mineral-rich composition has many health benefits. It’s sulfurous taste is distinctive. Mixed with cold water, this yields many glasses of delicious, tangy aam panna.It still has a tongue-clicking tartness but with alternating waves of sweet and salt. I like aam panna to be balanced with equal amounts of sweetness and savoury flavours. But you can choose to use only salt or sugar if that’s your preference. It allows you to play with flavour, by adding crushed mint or finely chopped green chillies or honey instead of sugar. I’m thinking of adding a dash of vodka to jazz it up for Sunday brunches or club soda for a fizzy version. 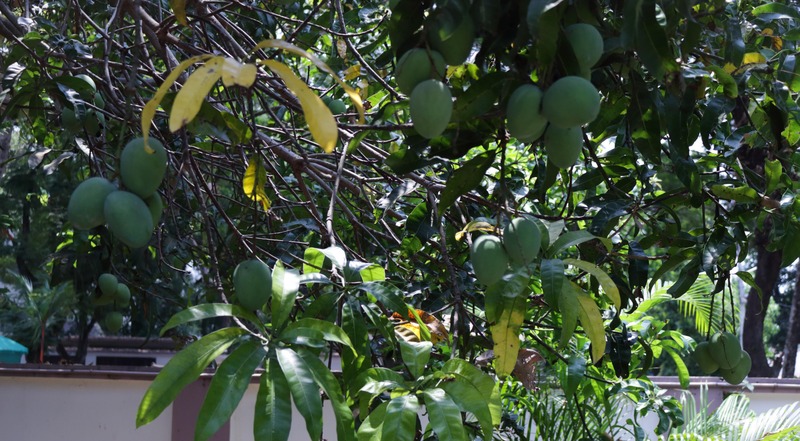 During the hot summer months, long before sodas and bottled drinks existed, ingenious home cooks used raw green mangoes, available in plenty (most homes had their own mango trees), and turned them into something that’s not just delicious but also healthy. And every year, we turn to these simple, traditional recipes that have become synonymous with the hot season. I enjoy repeating these rituals. They bind me to my roots and reinforce a way way of life, that is rapidly changing. And as another summer looms large, I’m drinking glassfuls of aam panna, silently grateful for its invention. Sour, sweet and salty, aam panna is a cooling raw mango cooler perfect for hot summer days. Boil the mangoes in a large pot of water for 15-20 minutes until their skin has burst and they have softened. Remove the mangoes from the hot water and cool to room temperature. Peel the cooled fruit and extract all the flesh in a bowl. Squeeze the stone to yield all the squishy pulp around it. Add sugar and salt to the pulp and whizz with an immersion blender (you can also do this in a food processor), till the sugar has dissolved and you have a thick, soupy liquid. In a jug, dilute this concentrate with 700 ml cold water, season with cumin powder, mix and chill till ready to serve. This drink looks truly refreshing, Supriya! Mangoes have become a favorite fruit, and I’m interested in trying this recipe. Your prose is lovely, by the way. Very nice writing style. Thank you Dawn. Do try it. Blitz in a few mint leaves for a delicious twist. i’ve never heard of this! i’ve been sitting in my mango lassi bubble for too long (; it sounds so cooling, especially if you add mint! Oh and I love the name of your blog… it is so cute. I am crazy about cumin and very intrigued by adding it to this mango drink. I love it when sweet and salty are in balance too. I need to buy some green mangoes next time I am out shopping for green papaya. Milena, cumin is great with tangy drinks. In India it is also used to flavour spiced chaas (buttermilk), another great summer refresher. Thanks David. Let me know how it turns out. Looks so refreshing and it sounds wonderful!! I didn’t know that you can use green mango this way…the drink looks so refreshing! I just love mangos and this drink looks beyond refreshing! This is such a refreshing beverage for the hot days! Mangos rule! You’re right Agnes, they do!